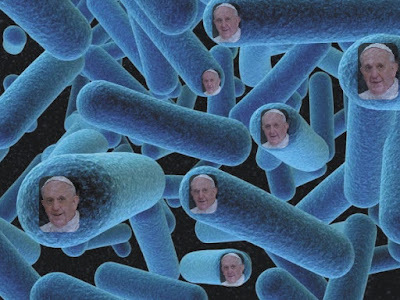 Rorate Caeli reports today on the renewed threat that a virus known as Franciska poses to the world. Symptoms of the disease which has seen victims lapse from attendance at Church while complaining of an unformed conscience include moral confusion, a descent into relativism, a propensity to grave errors, the sudden and unexpected promotion of an environmental agenda at times of mass apostasy within the Church and the projectile vomiting of ones own opinions at unnecessary times and outside of the spheres of the victim's own competence. It is passed on through word of mouth and also by hearing or reading media reportage of Catholic affairs emanating from Rome. Rome itself, however, is not thought to be the origin of the disease. Scientists believe the origins of the disease lay elsewhere and may have started life in Buenos Aires in 1936.